Blog: Home » Flavoured Coffee- Beans, Instant and Decaff! This week we are going to talk about our HUGE range of flavoured coffee. 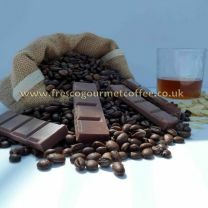 Many coffee enthusiasts think that flavoured coffee is a way of using up old coffee, masking the quality with a flavour, not at Fresco Gourmet Coffee! All our flavoured coffee is made from the finest Arabica beans, ground to your liking. All our flavoured coffee is sugar and calorie free, so suitable for diabetics and anyone watching their weight! Coffee lovers have been flavouring their coffee for centuries. History shows that a hundreds of years age in the middle east people started to experiment with their coffee blending it with nuts and spices, this progressed to the modern day versions of adding flavoured syrup and then introducing complex flavours directly on the coffee beans as part of the roasting process, so when you use these beans to brew your coffee the flavour is extracted into your coffee. You can buy our flavoured coffee in beans, cafetiere, espresso and filter grind. You can start off with a taster bag of 100g for £3.49 (no delivery charge of coffee J) or go big once you have found your favourite flavour and order 1kg for £17.49. We also sell our coffee in cost effective multi buy packs , so you can order your favourite cheaper or mix and match to try new flavours. Amaretto Chocolate – Breathtakingly tangy taste of almond liqueurs mixed with a smooth hint of tastey chocolate. Coconut Cream – Made with freshly roasted Arabica beans, this delicious flavoured coffee will feature a rich cream that fuses brilliantly with the fruity, subtle tang of coconut juice. Amaretto Royale – A slightly sweet, classic flavoured coffee. One of the most popular after dinner dessert coffees, Amaretto flavoured coffee is reminiscent of marzipan, ground almonds and apricots. Silky smooth flavoured coffee, premium quality and fresh roasted for the best flavour anywhere! Caramel Fudge Twist – Caramel fudge twisted with our gourmet coffee, fantastic aroma and great caramel taste. Maple Walnut – Fresco’s Maple Walnut Flavoured Coffee combines the delicious flavours of sweet maple syrup and the smooth nutty taste of fresh walnuts with our high quality coffee. Gingerbread – The warming spices of ginger and a hint of cinnamon are married with our Colombian bean. Littles Chocolate Orange Instant Coffee – Like Terry’s Chocolate orange, chocolaty, orangery, simply delicious. French Vanillia Decaffeinated Coffee – Rich in warm vanilla flavours and bold in finely roasted Arabica coffee.